I'm all over straight leg, non-stretch, raw hem jeans at the moment. And if they don't already come with the raw hem, I'll buy them in the longest length available and cut them myself. I've just picked up these Topshop ones in a couple of colours, and I think I'll be wearing them all Spring! Another style staple for me is button down camis. I've been a fan of these for the longest time if perfectly honest, but they've never been in fashion since the 90's/early 2000's, and they're finally back! They get bonus marks for having either tortoiseshell-coloured or mother-of-pearl buttons too. They get a bad rap, and are clearly in financial difficulty lately but I really enjoy New Look. They're incredibly affordable, for trend-driven fashion that you don't want to invest in, and whilst there's a fair amount of stock that is ill-fitting or not very good quality, there are definitely gems if you look for them - like these suede boots under £50! 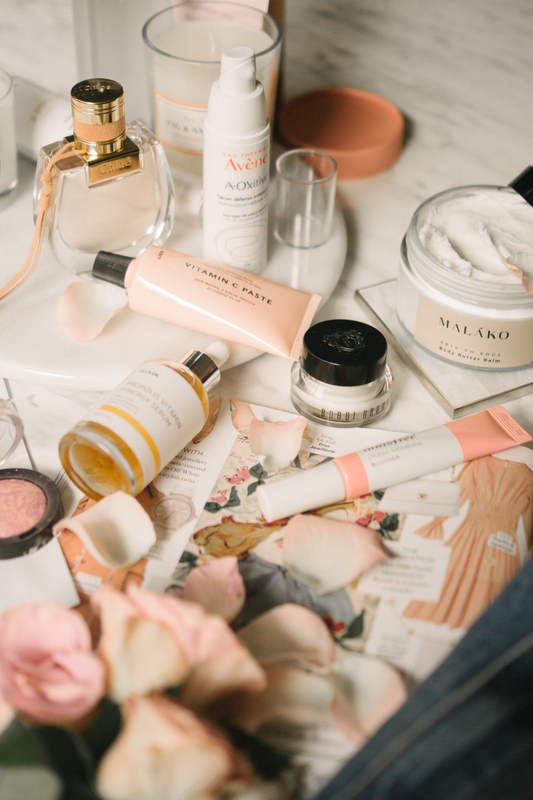 As far as skincare is concerned during Spring, I think it's all about hydrating toners and serums for me - they're the textures that I'm most drawn to. 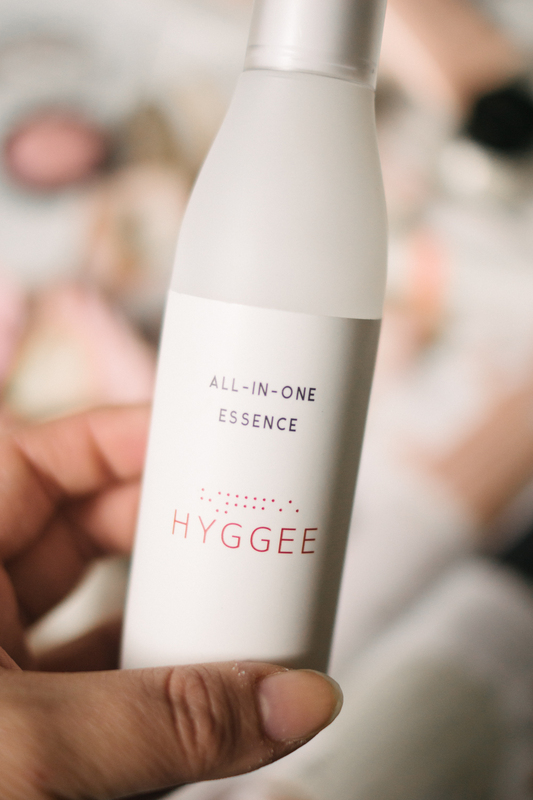 I've been really getting through my Beauty Water c/o recently, as I've been taking it away with me pretty much everywhere - it's a lovely, multi-tasking product to include in my routine to remove, clarify and brighten. 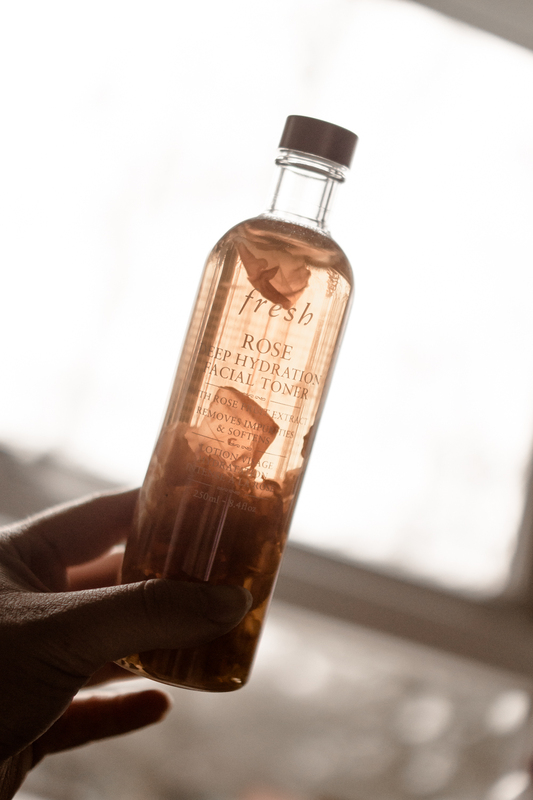 I was recently sent the Fresh Rose toner and I knew I was going to be a big fan (I've loved similar from Neogen, Natural Pacific, Secret Key etc so it was no surprise). I'm playing about with more from their Rose line at the moment but first impressions are so good. I mentioned the Iunik Propolis Vitamin serum c/o in a couple of posts here and here, and months later, I'm still loving it. 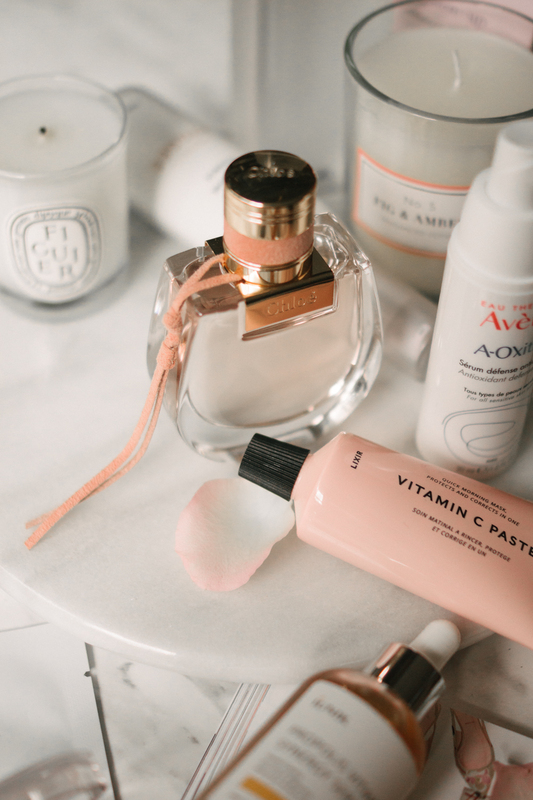 Andddd, I picked up both the Avene Antioxidant serum and the Hyggee All In One serum, and boy these two - if you must get two items from this post, it might be these two. I think I'm nearly out of the Avene (although it's hard to tell because of the opaque, vacuum pump bottle) but I'll be repurchasing both for the foreseeable future regardless. 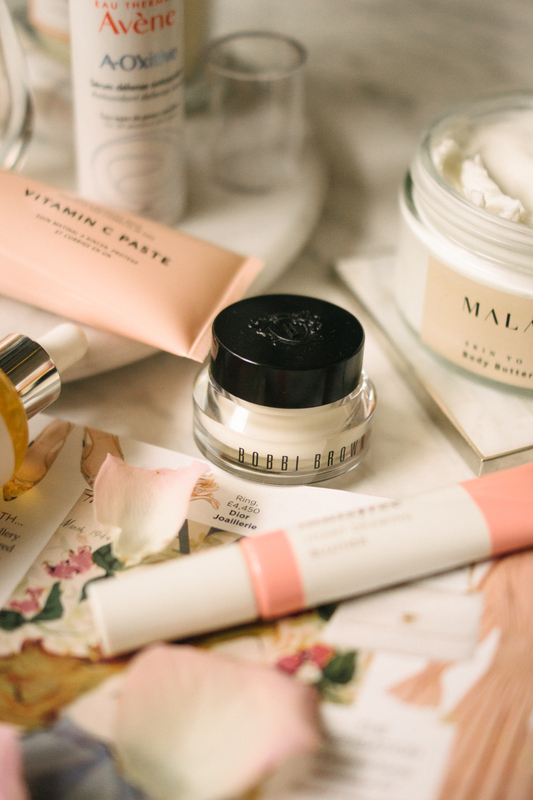 I'm in one of those moods when it comes to sheet masks where I don't want to faff with them, the moisture, the dripping etc, but I'll make an exception for the Keeome masks (which I mentioned in this skincare post). They're laden with essence, and leave my skin feeling so intensely hydrated. I've been loving taking the Nooni Brighten eye masks travelling with me as well - they're individually packaged and great to pop into a hotel mini fridge for a compact, refreshing pick me up. I'm going to leave facial skincare with a nod to my Lixirskin Vitamin C Paste - I love this stuff! I reviewed Lixirskin in this post if you're interested about the range, but the Vitamin C is my stand out product. It's instant gratification (which I'm always into ;) and is the perfect, lazy-girl morning treatment to leave my skin feeling baby smooth. 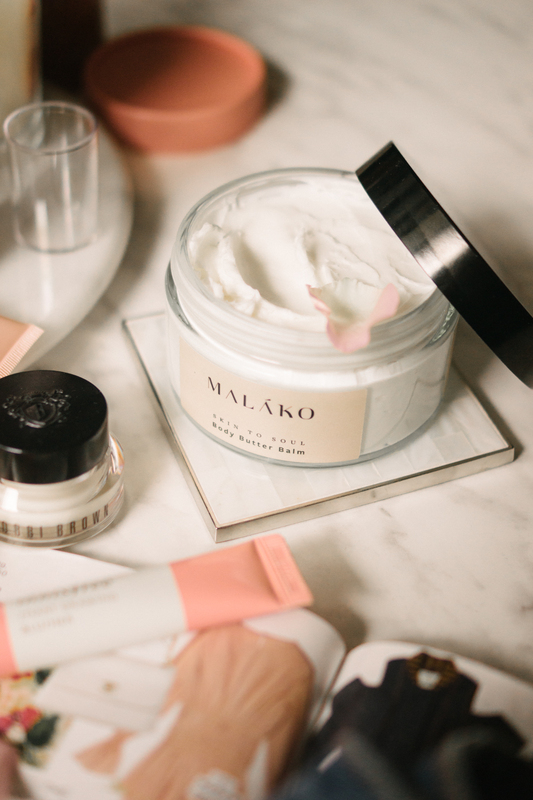 I've only mentioned this so far on my Instagram, but I'm in love with the Malako Body Butter Balm. They kindly sent me it over to try, with no obligations, and I'm so very happy with it. Aside from being ever so rich and nourishing, it smells divine, a kind of frankincense/herbal note mixed with delicate blossom/sweet florals. And one that I'm just going to quickly touch upon, because I'll be talking about it very shortly, is the new Chloe Nomade perfume c/o. I'm wearing it for tonight's date night and it's warmed right up to my skin, giving off a warm, sweet, feminine, woody scent. I'm not really a primer person, although I can't deny I've enjoyed Benefit's Porefessional, but since my reasonably recently visit to the Bobbi Brown counter (to try their new long wear foundation, which I ended up coming away with too), I fell in love with the Vitamin Enriched Face Base - a silky primer + moisturiser that's a beautiful base before makeup. I'm seemingly into blush recently (even though, as I was telling my friend the other day, around 10 years ago, I didn't wear blush, nor lip or brow products, and I didn't know about curling my lashes..). One that I seem to have forgotten about for a while, are the Maxfactor Creme Puff blushes - wildly underrated in my view. Seductive Pink (an odd name) is such a pretty, slightly cool toned flush, that I'm just wearing everyday at the moment. Another well-loved product is my Innisfree Smart Drawing blush. I think these are gorgeous, in fact, the whole Smart Drawing range is. They're so inexpensive too, and they've added a couple of new shades since my review here. 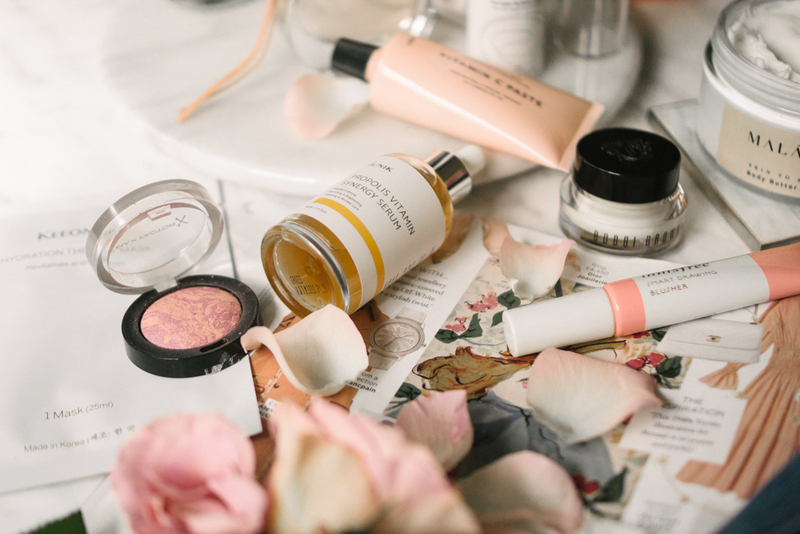 Lovely post and photos, love the peachy color scheme! :) That Innisfree blush looks beautiful! I am so into button down dresses right now... love them! Love these photos! They're so feminine and romantic. I also love a button down cami. I recently bought a cool version from Mara Hoffman. I wish Max Factor would come back to Canada!! 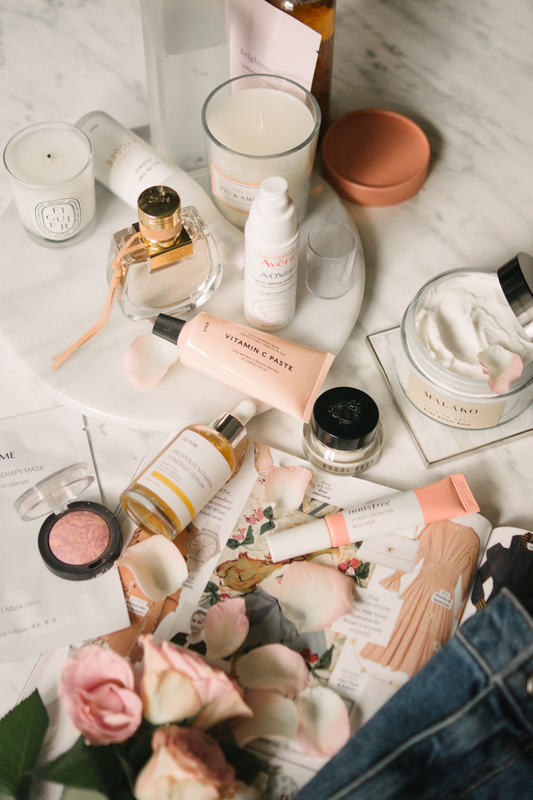 This blog post was so beautiful to look at (your photos are amazing!!) but I loved all the suggestions! I'm so excited to add some new spring pieces into my wardobe!